Tickets include dinner and the concert. 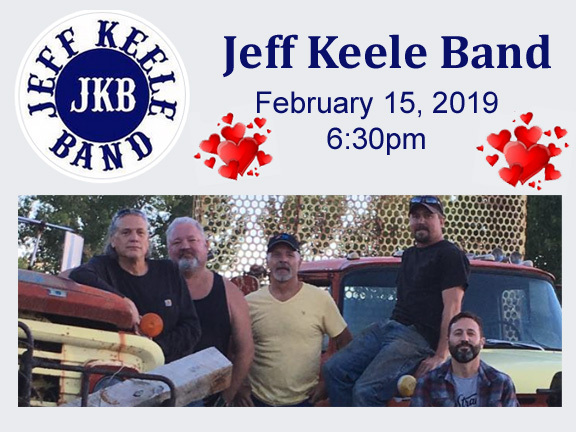 Jeff Keele Band has been together for approximately 8 years. All Band members are local Carbon County Born members. They Love to support and contribute to their home town. They are Carbon Counties favorite home grown band, whenever they play they have a sold out crowd. They started out as a cover band, playing the hottest Country and Rock songs. Then Jeff decided to start writing his own songs. 2 years ago they recorded their own album "Hot Black Coffee" all the songs are written by Jeff Keele, and by Brian Sherman. The Next year they went back to the recording studio and recorded their second album "West Bound". Once again the songs are written by Jeff and Band members.